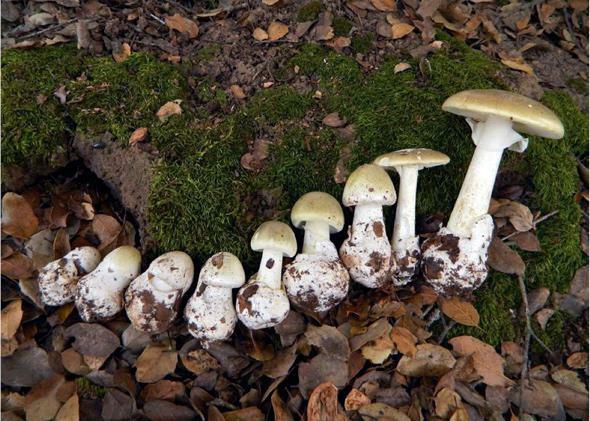 Most dangerous mushroom: Death cap is spreading, but poisoning can be treated. The death cap is spreading. It looks, smells, and tastes delicious. The death cap, Amanita phalloides, from button stage to full-size fruiting body. The death cap mushroom likely kills and poisons more people every year than any other mushroom. Now there finally appears to be an effective treatment—but few doctors know about it. When someone eats Amanita phalloides, she typically won’t experience symptoms for at least six and sometimes as many as 24 hours. Eventually she’ll suffer from abdominal cramps, vomiting, and severely dehydrating diarrhea. This delay means her symptoms might not be associated with mushrooms, and she may be diagnosed with a more benign illness like stomach flu. To make matters worse, if the patient is somewhat hydrated, her symptoms may lessen and she will enter the so-called honeymoon phase. Meanwhile, the poison stealthily destroys her liver. It binds to and disables an enzyme responsible for making new proteins. Without this enzyme, cells can’t function, and liver failure results. Without proper, prompt treatment, the victim can experience rapid organ failure, coma, and death. A few mouthfuls of death cap mushroom can kill. Extremely adventurous mushroom connoisseurs have supposedly removed toxins from slightly poisonous mushrooms such as the fly agaric, Amanita muscaria—the archetypal red and white polka-dotted mushroom beloved by Nintendo video game enthusiasts and nature artists. A complicated boiling process is said to allow the nutty-tasting mushroom to be enjoyed with no harm. Despite folklore to the contrary, the death cap’s deadliest toxins, called amatoxins, cannot be removed this way. Amatoxins cannot be destroyed by any conventional cooking method, including boiling or baking. Freezing or drying the mushrooms also fails to remove any amount of amatoxin, instead preserving it to wreak havoc later. The death cap doesn’t taste remotely like death—many people who are poisoned claim the mushroom was the most delicious they’ve ever eaten. Its appearance doesn’t scream deadly, either: In its early “button” stage, it closely resembles immature edible white species, including the common field mushroom Agaricus campestris. Full-size death cap is reminiscent of other innocuous mushrooms. In California, a number of immigrants have confused it with the edible paddy straw mushroom Volvariella volvacea, which is harvested in Asia. Upon ingestion of death cap, about 60 percent of the absorbed amatoxins travel directly to the liver. Both poisoned and healthy liver cells spit out amatoxins into bile, which is then concentrated in the gall bladder. After each meal, the gall bladder releases bile into the gut, and the amatoxins travel with salts in the bile. At the end of the small intestine, most the bile gets reabsorbed back into the liver. Amatoxins re-enter the liver via the same receptors as the bile salts, and the poisoning cycle repeats. The other 40 percent of absorbed amatoxins initially make a beeline to the kidneys, which serve as the blood-waste treatment center of the body. Healthy kidneys can extract amatoxins from the blood and send them to the bladder—an ability that is rare for liver poisons. Until the kidneys kick out every last bit of poison, amatoxins continue damaging the liver. The kidneys can continue to function only if the victim stays sufficiently hydrated. Without aggressive hydration, amatoxins poison the kidneys as well. After the kidneys fail, rapid organ failure is not far behind. But if the patient still has liver and kidney function, and enough fluid to urinate regularly, she can essentially pass the still-intact amatoxins out in urine, like the smallest, deadliest kidney stone. To keep the amatoxins from causing damage, a drug would have to protect the liver while the kidneys eliminated the poison. A nationwide clinical trial is testing a new treatment for amatoxin poisoning: silibinin, a drug derived from the plant milk thistle, Silybum marianum. When administered intravenously, the compound sits on and blocks the receptors that bring amatoxin into the liver, thus corralling the amatoxins into the blood stream so the kidneys can expel them faster. S. Todd Mitchell of Dominican Hospital in Santa Cruz, Calif., and his team have treated more than 60 patients suffering from amatoxin poisonings. Every patient who still had intact kidney function and was started on the drug within 96 hours of eating mushrooms has lived. Only a few patients sought treatment later and did not survive. Medical treatment often goes awry in the early stages of amatoxin poisoning. Poison control centers generally recommend three main treatments, none of which is effective. First, activated charcoal is recommended to prevent poisons from being absorbed by the gastrointestinal tract and causing liver damage. This works well for most poisonings, but by the time a patient usually seeks medical assistance for amatoxins, the poison has traveled well past the GI tract. Similarly, centers often recommend pumping the patient’s stomach, which is hard on the body and does nothing to remove the amatoxins damaging the liver. Third, acetylcysteine is often prescribed. It is very effective at preventing liver damage in acetaminophen poisoning. But in amatoxin poisonings, it is completely ineffective, thins the blood unnecessarily, and gives misleading liver-function test results. These recommendations make the patient sicker while diverting attention from the most effective weapon against amatoxins: aggressive hydration. Part of the challenge of recognizing the symptoms of amatoxin poisoning and properly treating it is that mushroom poisonings are relatively rare. The first time a physician treats a patient for amatoxin poisoning, Mitchell explains, is likely to be her last. Doctors may be encountering more cases in the near future, however. This pure white variety of death cap, Amanita phalloides var. alba, resembles many edible species, especially when young. The death cap mushroom is an invasive species from Europe, now present on every continent except Antarctica. It became such a world traveler because humans spread the mushroom’s spores around like glitter at a kids’ glitter party. Fungi such as the death cap are ectomycorrhizal, meaning that they live symbiotically on the roots of trees. The fungus extends from the roots to form a network in the soil, called a mycelium, which is much finer than tree roots. The mycelium can more easily reach nutrients like nitrogen and phosphorous than the tree can, and it trades these nutrients with the tree in exchange for sugars, which the tree makes using photosynthesis. A mushroom is the lovechild of two sexually compatible mycelia. Mushrooms in turn make tiny spores that easily disperse and can grow into new mycelia. In the 19th century, people tried introducing their favorite trees to new continents. Seeds were planted but quickly died. Nothing seemed to help until someone had the bright idea to bring seedlings in pots with their native soil. The soil worked like a charm. The trees grew smashingly, but people didn’t know they had spread fungal spores and other soil microbes along with the trees. A few researchers in the mid-20th century did notice that some mushrooms seemed to have appeared in new areas, but because they lacked a historical baseline for fungal diversity, nothing could be proved. Most scientists simply assumed the death cap was native to both Europe and the United States. Anne Pringle became interested in the death cap as a postdoctoral fellow studying fungi at the University of California–Berkeley. (Disclosure: She later became my graduate adviser.) She was learning the local mushrooms by collecting them in the small canyon behind her house. She brought one sample to an adviser, Tom Bruns, who identified it as Amanita phalloides. He then hinted about an enticing rumor among the amateur mycological community that the death cap wasn’t actually native to California. Pringle admitted the idea was interesting but didn’t think too much about it until Bruns dropped some not-so-subtle hints that she should investigate, such as leaving drawings of a skull and crossbones on her desk. Pringle quickly learned that scientists in the early 20th century had been using descriptions to identify death cap that were so broad they encompassed several other species. By sequencing the DNA of old, dried specimens in collections across the country, she found that all specimens labeled before 1938 were actually different species of Amanita. While other North American mushrooms had long records in herbaria, the death cap made a sudden appearance in 1938 and became increasingly common after that year. Pringle also sequenced the DNA of wild A. phalloides mushrooms picked in the United States and Europe. She found much less genetic variation in U.S. mushrooms. That indicated that the species had started in Europe and that the U.S. mushrooms had undergone a “population bottleneck” in which a mere handful of individuals had colonized the continent. 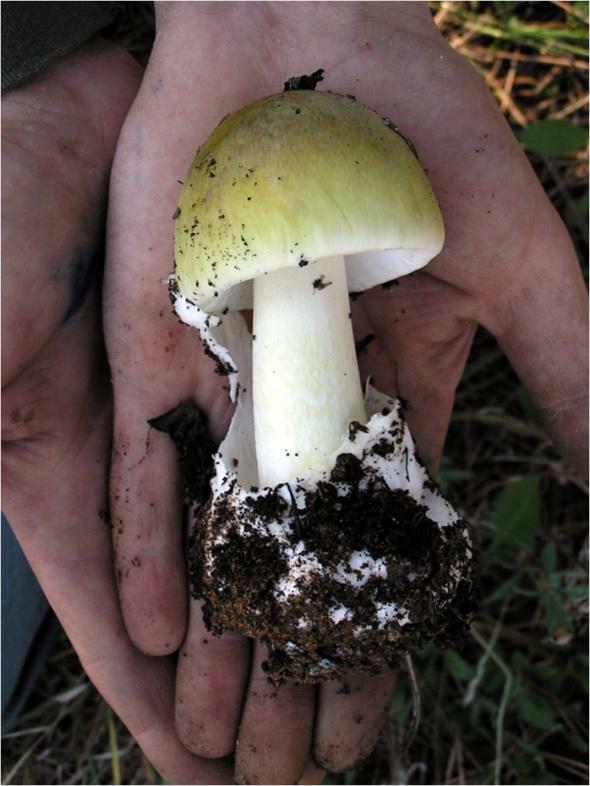 A young death cap specimen. 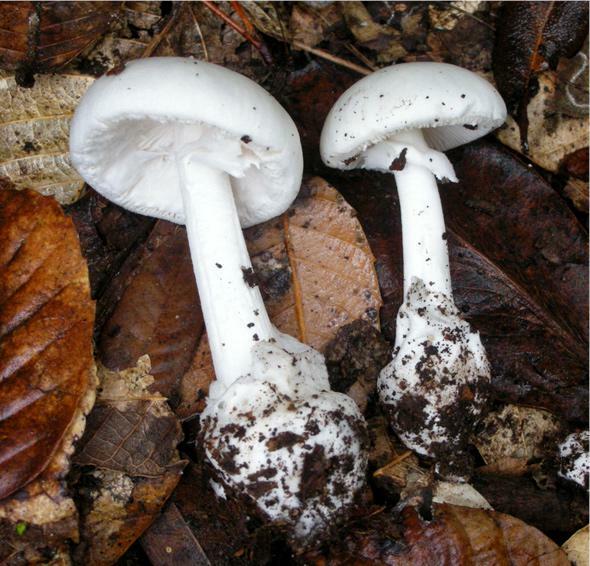 Why were most scientists wrong about the death cap? Prior to Pringle’s discovery, known invasive fungi fell exclusively into the category of plant or animal diseases, such as the one that wiped out the American chestnut. These fungi were ones we can usually see on the host, and they cause obvious symptoms. The death cap can’t live without its tree host. In order to become invasive, A. phalloides underwent something incredibly rare: a host shift. The fungus somehow switched from being able to grow only on European oak roots to growing on a completely different oak species, the California live oak. Not only was it able to colonize a new species of oak, but in the United States it has also been found to grow on native pines. A shift from partnering with a deciduous oak to canoodling with a coniferous pine tree is a very large step for a fungus. Pringle’s discovery shook up scientists’ ideas of what it means to be a symbiont. The death cap story intrigued me, and it is one of the reasons I joined the Pringle lab. I am currently conducting a literature review of research on Amanita phalloides and hope to eventually uncover the cellular mechanism by which the death cap was able to switch hosts. The death cap is now widely distributed in the United States. Based on the weather patterns within its native range, it appears to have spread as far as tolerable conditions allow on the East Coast. But there are still areas in the Pacific Northwest and Canada that it should be able to live in but where it hasn’t yet been recorded. The mushroom is spreading in Ohio, and marching south into Mexico. With this long history of confusion about whether or not the death cap is native, combined with the fact that it’s still spreading, it’s not surprising that people accidentally harvest and eat it. Similarly, it’s no wonder that people intentionally eat it: It’s large and meaty, it’s often plentiful, and it smells delicious. Even very experienced mushroom hunters aware of both the historical confusion and the death cap’s resemblance to edible fungi have been poisoned by Amanita phalloides. Because the mushroom is so deadly and can grow side by side with edible species, one wrong mushroom picked in the failing light can invite disaster. If you ever suspect you may be suffering from mushroom poisoning, ask your doctor to call Mitchell in Santa Cruz and request to be enrolled in the milk thistle treatment study. He will ship silibinin to anyone, anywhere in the world. And remember to stay hydrated if you want to live.